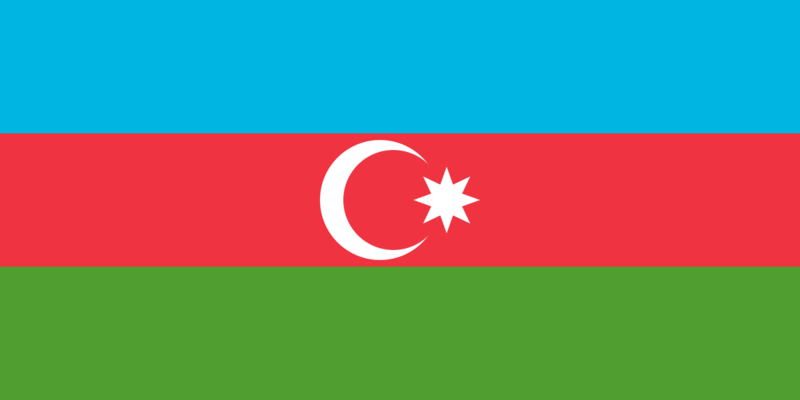 This work is not an object of copyright according to the law of Azerbaijan Republic No. : 115-1Q of 5 June 1996 on Copyright and Neighbouring right; this image is in the public domain worldwide (details). d) communications concerning events and facts that have informational character. Comment – According to interstate and international compacts the Azerbaijan Republic is the legal successor of the Azerbaijan Democratic Republic and Azerbaijan Soviet Socialist Republic, therefore this license tag is also applicable to official symbols and formal documents of the ADR and Azerbaijan SSR. 19:34, 28 May 2011 1,200 × 600 (722 bytes) Zscout370 Did the math and the previous drawing was not correct according to http://en.wikipedia.org/wiki/File:Flag_of_Azerbaijan_%28construction_sheet%29.JPG. The white crescent size is still troubling me, but everything else I done does match. 21:49, 23 February 2011 1,200 × 600 (1 KB) Zscout370 Combined the version with the correct dimensions and my version with the correct Pantone colors. 18:40, 18 February 2011 1,200 × 600 (1 KB) Sertion Reverted to version as of 09:37, 13 November 2009. No actual improvements.